We’d love your help. 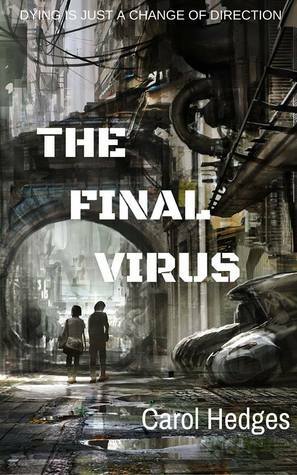 Let us know what’s wrong with this preview of The Final Virus by Carol Hedges. A YA novel set in the future. To ask other readers questions about The Final Virus, please sign up. This book is in the process of being uploaded to Amazon Kindle. It should go 'live' in the next 10 days. The Final Virus is a novella (46 thousand words). It's quite scary. I was quite scared and I wrote it. Want to read it? I've read Carol Hedges' three Victorian murder mysteries and loved them; even though I am not a fan of YA books I love the whole post apocalyptic genre, so was keen to give this a go. The story centres around Will and I've read Carol Hedges' three Victorian murder mysteries and loved them; even though I am not a fan of YA books I love the whole post apocalyptic genre, so was keen to give this a go. The story centres around Will and Amber. Will is popular, clever and sought after; Amber is a non-conformist with strange intuitive capabilities. Oddly attracted to each other, they come together to investigate the truth behind the death of Will's father and possible government conspiracies. As always, Carol Hedges' characters are immediately real and three dimensional, the dialogue sharp, realistic and often funny; there's a definite element of dry humour throughout this book that I liked very much. However, I would have liked to know much more detail about how the current situation came to be, and how the people now live, how the world had changed as a whole; at the beginning I couldn't quite work out what was going on, when and where it was supposed to be taking place, etc, though some of my questions were answered fairly soon (by Mr Neots, the boring teacher, a great character! ), and more later. In a dystopian future, Earth’s environment has completely changed following a spate of natural disasters which claimed a huge percentage of the populace and caused extreme climate change. Plus a total cybercrash wiping the data from every chip, memory board and circuit on the planet. This new world is governed by just one president who revitalised the world and improved life for the remaining population. Seemingly. Will is still reeling from the sudden, and as he believes, suspicious, death of hi In a dystopian future, Earth’s environment has completely changed following a spate of natural disasters which claimed a huge percentage of the populace and caused extreme climate change. Plus a total cybercrash wiping the data from every chip, memory board and circuit on the planet. This new world is governed by just one president who revitalised the world and improved life for the remaining population. Seemingly. We have Will, a popular boy at school, I don’t generally read YA books but having enjoyed another book by Carol Hedges I chose The Final Virus and was delighted I did. This is the start of a series but can be read as a standalone and for me its greatest strength is in the superb characters the author creates. You know exactly who everyone is and they are as real as they would be if they were sitting right next to you, which with Mr Neots I’m glad is not the case as he really is a despicable man. Will and Amber live on a ‘New Earth’, one created after the planet was pretty much destroyed following a cybercrash. This new home is managed by the ‘President’, a character who remains elusive for the majority of the book. Amber is a loner with zero friends. W Will and Amber live on a ‘New Earth’, one created after the planet was pretty much destroyed following a cybercrash. This new home is managed by the ‘President’, a character who remains elusive for the majority of the book. That truth, however, brings them face-to-face with the worst kind of evil. Suddenly, Amber’s story becomes the main view point. But we have a very likeable hero in 17-year-old Will, distraught by the sudden death of his father he still manages to give emotional support to h This dystopian Young adult novel is set in a bland, pleasant, boring town where a group of intelligent teenagers are “educated” at a school which aims to make them amenable to the World Presidential dictatorship. Following a cybercrash, global warming, natural disasters and disease, continents had disappeared and the world’s population vastly depleted. But we have a very likeable hero in 17-year-old Will, distraught by the sudden death of his father he still manages to give emotional support to his little sister. Handsome and popular, he hasn’t taken much notice of oddball, Amber, who takes little interest in her hair or clothes and seems to be in a dream most of the day. However, they are drawn together by their unease about the apparent “good life” they are leading. Amber is the genetically engineered daughter of wealthy parents she hardly sees but she hears voices and constantly dreams of the four horses of the apocalypse. Will is convinced that his father’s death is no accident. The Final Virus is at the upper end of the word count for a novella, but could be read in one sitting if you have a couple of hours. This book possesses a good concept, with a little something different in the dystopian genre, and has some likable characters - as well as some easily loathed characters. It moves along at a brisk pace and the descriptive writing produces some vivid imagery. With this book being a novella, I felt as if too much was compressed into these pages and think the story could benefit from expanding the word count into the novel range and adding more details about the worldbuilding, characters, and their relationships, allowing for a more balanced plot line. I never had a good grasp of the governmental structure and would have liked to know more about Will and Amber and see their relationship develop at more gradual pace. There are some nice surprises and twists along the way, but the ending contained a lot of information over a few pages and I think with more details about the worldbuilding, it wouldn't have been quite as difficult to follow. I received a digital copy of this novella in exchange for an honest review through Rosie's Book Review Team.